This training is worth it’s weight in gold! As of this year, I have participated in over 1,000 short sales. 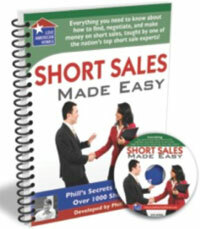 My lifetime profits from short sales are in the millions of dollars. That makes me one of the nation’s Top Short Sale Experts. Short sales are real estate transactions involving buying homes for less than their loan amounts so that the homeowner, and the lender(s) can avoid a foreclosure. This Training Program takes what can be a daunting subject for investors and breaks it down into simple steps in language that anyone can understand (you don’t need to be a lawyer or have graduated from an Ivy League college to get this). And as an added BONUS… when you order today I will give you access to my short sale processing team. That’s right, I will process your short sale deals for you, so you don’t have to worry about it. (This is the biggest obstacle and most time-consuming part of doing short sales for most investors).